Many trails lead to Russian Lake. 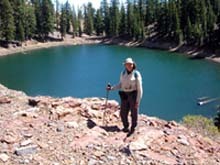 In August of 1999 (a year before my total hip replacement) we took the short, rocky scramble to Bingham Lake, then down the brushy outlet creek to the Pacific Crest Trail, south along the snow-blocked PCT to a jeep road up to Siphon Lake, thence across the tilting, exposed mountain flank to Russian Lake. We wanted to go back, but not that way. This time we would try a more direct route: the Deacon Lee trail. We drove to Weaverville on Sunday, then we headed north on State Route 3 over Scott Mountain summit (where we crossed the Pacific Crest Trail as it bore inexorably northward, swerving temporarily westward from the Eddies to cross the northern slopes of the Trinity Alps Wilderness) to the historically significant town of Callahan, currently in the throes of irrelevance, decay, and death. We shopped for ice, sodas, and munchies in Callahan's only remaining business, an ancient general store, whose wooden floors, shelves, and walls exuded the ambiance of a forgotten century. Just past the bridge at the end of town we turned left on the Cecilville Road and followed the winding two-lane blacktop over the summit dividing the Scott River drainage behind us from the Salmon River ahead. At Carter Meadows summit the Pacific Crest Trail crossed our path a second time, emerging refreshed from the Trinities and bound for the ragged granitic spires of the Russian Wilderness to the north. Had we chosen, the PCT would have taken us northwest to Russian Lake in seven or eight miles via the familiar jeep road to Siphon Lake. Instead, we followed the two-lane down a long winding grade, losing altitude that we would soon have to regain. We passed the Trail Creek Campground, where another trail would have afforded us a four-mile, two-thousand-foot climb to Russian Lake. Two miles further, we turned right on forest service road 39. After climbing ten miles of good dirt road, we reached the Deacon Lee trailhead on a long forested ridge 6800 feet above sea level. The ridge was wide enough to accommodate twenty or thirty cars on both sides of the road, but we were surprised to find only two there. And on Labor Day weekend! Fire permits had been canceled, even for the high wilderness, so we tried out our Sierra stove to see if it would work for our backpack. A little battery-powered fan attached below a small pot blew pieces of bark, twigs, and sticks into the inferno of a blacksmith's forge, quickly boiling our water for dinner. After a scrumptious freeze-dried repast, we strolled along the ridge road until the forest opened onto vistas in all directions and deciphered the course our trail would be taking us, down to an open saddle, around two forested red-rock slopes, and into the distant granitic cirque. That evening we heard the "Who's awake? Me too!" of several Great Horned Owls. (Hear owl) Young deer skulked on the edges of our campsite. It was very warm sleeping in the van. Monday morning we awoke to find that the deer had dragged away two of our three walking sticks. We did retrieve the better one, a gift from Barbara's sister Joanne, and the dirt and deer slobber cleaned up nicely. The other, Barbara's original collapsing stick, was lost forever, alas. We heard the miniature horn toots of a nuthatch and saw two bluebirds before hitting the trail at 9 A.M., hoping to beat the sun and heat. The trail angled down the eastern slope from the parking lot to a narrow, exposed high saddle. Through the haze to the northwest lay English Peak, the Marble Mountain, and Black Mountain in the Marble Mountain Wilderness. To the southeast snowy Thompson Peak, Sawtooth, and Caribou Mountains crowned the Trinity Alps Wilderness. The views were spectacular. Three day-hikers were heading in at about the same time, but without backpacks they quickly blew past us. We met two other parties hiking out from Russian Lake, which accounted for all the cars at the trailhead. There were forested areas along the way, meadows, and two small creeks, but it was not an easy trail. 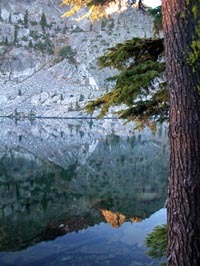 Much was exposed, offering a continually changing view of the Trinity Alps. After winding in and out of several gullies, we finally climbed over a ridge and saw, level with us across a forested basin, the granite headwall of our destination. Inexplicably, however, the trail did not contour evenly around the basin, but descended hundreds of feet through broken slates and shales and schists and cherts before climbing back up through huge granite boulders and loose granite sand to a trail junction. 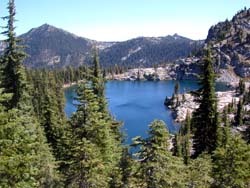 The right-hand trail led up the reddish slope to Siphon Lake. We took the left fork, entering the wilderness, and climbed up and over a ridge offering our first views to the northeast. Below was the deep granitic canyon of South Russian Creek, and as we descended a switchback, we caught a glimpse of Lower Russian Lake 500 feet below. A little further we crossed the outlet of Waterdog Lake at 7000 feet. Tired, we had planned to rest awhile at Waterdog Lake. But the day-hikers were eating lunch on the shore, and a mild paranoia drove us to press on to the only good campsite we remembered at Russian Lake before someone else got to it. When we had climbed the final hundred feet to Russian Lake, sweaty and drained, we rejoiced to find our old "primo" campsite open (see opening photo). The site was smaller and rougher than we remembered, but the lake spread out spectacularly at our doorstep. Russian Lake rests at the collision point of three geological regions. Gouged out of granodiorite by glaciers, the lake lies on the southwestern edge of the Russian Peak Pluton, and the granitic bones of white rock strew the smooth glacial-polished benches that march northeast down to South Russian Creek, then rise on the far side as jagged Russian Peak. 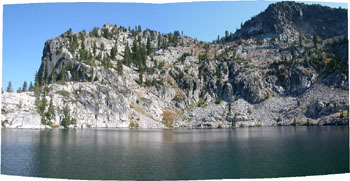 The cliff face above Russian Lake mutates from pale gray granitic rock on the left to deep gray-brown metasedimentary native rockon the right, intruded by broad bands of the lighter granodiorite. A filigree of quartz intrusions slash through both like mad Jackson Pollack petroglyphs. In these rocks one might find gold. Beyond the peaks which tower over the lake lies a mountain of red ultramafic rock, probably peridotite. 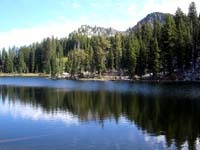 There, a half-mile south as the crow flies, Siphon Lake sits in its own bowl of red rock. Cool gusts off the lake buffeted us occasionally, so we changed into dry clothes, set up the tent in the small clearing farthest from the shore, inflated our pads, fluffed our sleeping bags, strung the hammocks, and hung our packs from nails conveniently hammered into the sheltering mountain hemlocks. The weather was beautiful, but windy off and on that afternoon and evening. Campfire restrictions were in place, so we fired up our Sierra stove for dinner. No one else camped at Russian Lake or Waterdog Lake. Tuesday morning was pleasant on Russian Lake, but then the wind came up. We hiked down to Waterdog Lake to an increasing cacophony of cow bells. Black cows had infested the meadows above the lake like large clanking beetles, retreating from us as we approached. No humans could be found. 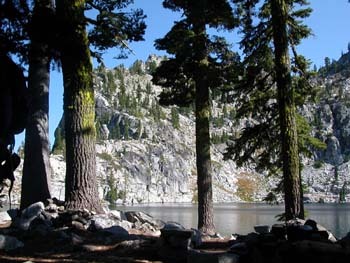 We could not escape the gusting wind at Waterdog Lake, in the meadow between the lakes, nor even on the shelves carved like giant steps in the granite below Russian Lake. So, we took a nap in the tent. Later, refreshed and rejuvenated, we were able to definitively identify Russian Peak and the cirque below it that held Bingham Lake, thanks to the GPS. 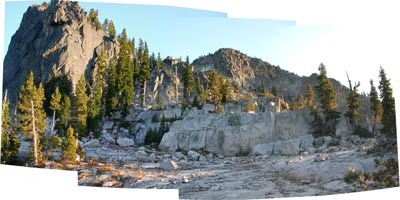 Like a nail scratch in the finish of a new car, the Pacific Crest Trail was gouged into the granite wall above South Russian Creek, and we traced the route we had taken on our first trip to Russian Lake from Bingham Lake. By evening the incessant southwest wind was blowing mercilessly. We managed to find a little shelter in the granite benches below Russian Lake as we ate dinner, but when it started to get dark and with no campfires allowed, we gave up and went to bed early. On Wednesday morning the cows decided in their cow brains that their cow destinies would be vastly improved if they wandered up to our lake, but I managed to chase them back down into the meadow by yelling, clacking sticks, and throwing rocks. We then climbed up the steep cutoff trail at the south end of the lake and day-hiked to Siphon Lake, where we ate lunch and explored the red rock hills above that lake. Syphon Lake lies outside the wilderness and tracks in the red-dirt road indicate it is frequented by off-road vehicles, probably from Trail Creek Campground. The lake derives its name from an abandoned water syphon which once diverted its waters to a hydraulic mine somewhere below. In the woods on the outlet stream across the road is a small, comfortable campsite, furnished with a few roughhewn timbers and rusting relics of the syphon pipe. We watched a day hiker with three dogs climbing toward the ridge above the lake, then lost sight of him. We wanted to climb to the same ridge and perhaps look down on Russian Lake on the other side, but as we rose out of the red-rock bowl, a cold wind blasted us into submission, and we turned back. Oddly, the exposed trail back around the mountain was relatively free of wind. 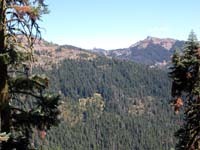 We paused to admire and photograph the peaks of the Trinity Alps. Following the trail all the way back to Waterdog Lake, we swam at the calm leeward end, and the water was not too cold. Then we warmed ourselves on the bank in the afternoon sun. Climbing back up to Russian Lake, we heard cows bells clattering from the direction of our tent. Sure enough, a couple of the large black beasts stood stupidly in the center of our campsite, eyeing our approach with bovine incomprehension. Enraged, I again drove them down to the meadow with sticks and stones and terrible yells. They left splattered cow-pie mementos along the path but, miraculously, none in our camp. The wind finally calmed down, and we sat and watched the lake darken and the bats begin to swoop. That night the temperature dropped to 30 degrees. Thursday morning was sunny and calm on the lake. We drank our coffee and tea in the warm morning sun and tried to decipher meaning in the pattern of the trees and rock and the lines of quartz in the lake's mirrored surface. All was well with the world. We took our time hiking out, enjoying the great views along the way. At the van we tossed our packs in back without unpacking them, because we would spend no more nights away from home. At forest service road 39 we turned right and drove a few miles gaining altitude before we realized that we should have turned left. Backtracking, we soon arrived back at the Callahan-Cecilville road. 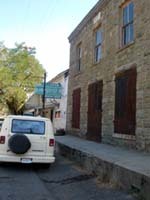 Then we drove to Cecilville, and home by way of Orleans, Hoopa, and Willow Creek. The road is slow and winding, but beautiful as it follows the Salmon River to its confluence with the Klamath, especially the one-lane sections east of Somes Bar. The drive takes just as long this way as going through Weaverville, even though it looks shorter on the map. We cut our vacation short to get back home because one my clients required my presence at a corporate board meeting early Friday morning. Usually we buffer the transition back to "reality" with a night at the cabin, a hot tub, or a motel room stay. Not this time. Far flung vistas of trees and rocks and geological time gave way abruptly to social exigency and the scramble for the almighty dollar. More paths hurry us thither than to Russian Lake.